Why do we like chocolate? Chocolate is made from cocoa beans, which have been grown and consumed in the Americas for thousands of years. The Maya and the Aztecs made a drink out of cocoa beans called xocolatl, which means bitter water. That's because in its raw form cocoa beans are intensely bitter. To get at the beans first the thick husk of the cocoa pod has to be cracked open, releasing a pulp that has an intense tropical flavour that's halfway between lemonade and a custard apple. Known as baba de cacao, it's sweet, acidic and very sticky. The beans and pulp are then sweated and allowed to ferment for several days before being dried and roasted. Roasting releases a range of chemical compounds including 3-methylbutanoic acid, which on its own has a sweaty rancid odour, and dimethyl trisulfide, the smell of over-cooked cabbage. The combination of these and other aroma molecules creates a unique chemical signature that our brains love. But the rich, chocolaty smells and the happy memories of youth that those smells provoke, are just part of chocolate's attraction. Chocolate contains a number of interesting psychoactive chemicals. These include anandamide, a neurotransmitter whose name comes from the Sanskrit - "ananda", meaning "joy, bliss, delight". Anandamides stimulate the brain in much the same way that cannabis does. It also contains tyramine and phenylethylamine, both of which have similar effects to amphetamines. Finally, if you look hard enough, you will find small traces of theobromine and caffeine, both of which are well-known stimulants. For a while, some food scientists got very excited about the discovery but to be honest, although chocolate contains these substances, we now know they are only there in trace amounts. Your brain is not going to get much of a chemical rush from eating a few squares. None the less, they may play a small part in seducing our senses. So what else does chocolate have going for it? Well, it also has a creamy viscosity. When you take it out of its wrapper and put a bit in your mouth without biting, you will notice that it rapidly melts on your tongue, leaving a lingering sensation of smoothness. Special touch receptors on our tongues detect this textural change, which then stimulates feelings of pleasure. But the thing that really transformed the cocoa from a bitter and watery drink into the snack we adore today was the addition of sugar and fat. The addition of just the right amount of each is crucial to our enjoyment of chocolate. Look at the side of a packet of milk chocolate and you will see that it normally contains around 20-25% fat and 40-50% sugar. In nature such high levels of sugar and fat are rarely found, or at least not together. You can get lots of natural sugars from fruits and roots, and there is plenty of fat to be found in nuts or a tasty chunk of salmon, but one of the few places where you will find both together is in milk. Human breast milk is particularly rich in natural sugars, mainly lactose. Roughly 4% of human breast milk is fat, while about 8% is made up of sugars. Formula milk, which is fed to babies, contains a similar ratio of fats to sugars. This ratio, 1g of fat to 2g of sugars, is the same ratio of fats to sugars that you find in milk chocolate. And in biscuits, doughnuts, ice cream. In fact this particular ratio is reflected in many of the foods that we find hard to resist. So why do we love chocolate? For a whole host of reasons. But it may also be that we are trying to recapture the taste and sense of closeness we got from the first food we ever sampled; human breast milk. Answer the questions. If a statement corresponds to a matching fact in the text, answer T (True). If it contradicts a fact in the text, answer F (False). If there is not enough information to decide True or False, answer NI (No information). Click or touch Check Answers. At any time you can click or touch the icon to open the reading passage. Click or touch when checking your answers to see the location of the answer highlighted in the reading passage. Click or touch Repeat to reload the activity. This activity includes 10 questions. The Mayans and the Aztecs made an alcoholic beverage using chocolate. There is nothing in the text that says they used alcohol. We only know that it tasted 'bitter'! The chemicals produced when chocolate beans are roasted smell terrible on their own, but together smell nice. Cabbage smells bad, but the combination of smells is pleasant. Chocolate has a narcotic effect. Anandamides stimulate the brain in much the same way that cannabis does. There are large amounts of chemicals in chocolate that can stimulate your brain. 'Trace amounts' means 'small amounts'! 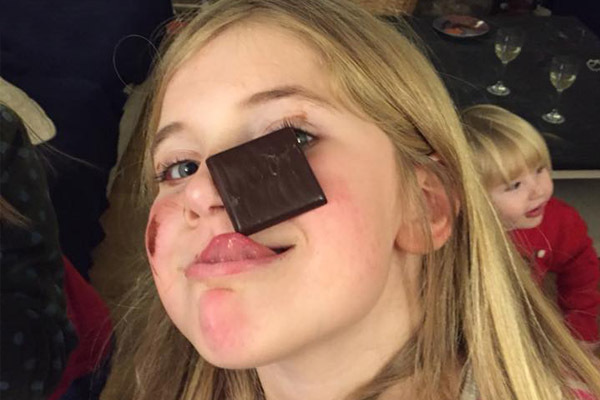 When you put a piece of chocolate in your mouth it remains solid until you start chewing it. Yum yum! ..it rapidly melts on your tongue. For the best flavour, the best fat content is 25% and the best sugar content is 50%. We are given ranges - 20-25%, 40-50%, but we are not told which numbers are 'best'. In formula milk fed to babies, the ratio of fat to sugar is approximately 4% fat and 8% sugars. Formula milk, which is fed to babies, contains a similar ratio of fats to sugars (i.e. similar to that found in breast milk). In chocolate ice cream, the ratio of fat to sugar is the same as in chocolate. We know about ice cream, but nothing is said about chocolate ice cream. Many of the foods that we most like contain the same ratio of fat to sugar that is found in chocolate. Chocolate makes us feel protected. The text compares the protection felt by by eating chocolate with that experienced when breast feeding.